"No, let's tell everyone else instead. She'll find out eventually." "Assemble The Muffins And The Meddled And Rent A Karaoke Machine--This Calls For An Intervention". Wanders, I was hoping that Mary and Toby would jointly tell Estelle in the most public place in Santa Royale (the produce section of Food Team? the Boardwalk? Early Bird time at the Bum Boat? ), but I like your suggestion better. And won't Estelle be grateful when she learns that Mary blabbed to the vacuous Toby about her SilverDaters debacle? Just picture Toby giving Chinbeard all the excruciating details. "Arthur Zerro" should have researched a better alias. Maybe "Arnold Zed..."
"Are you going to tell her or should I?" "Oh let me. I wanna tell her [giggle, snort]." "No, I wanna tell her [snicker, snicker]." "Hey, I'm the one who encouraged her, so I get to tell her!" "But I'm the one who discovered the fraud. I deserve to tell her!" "Okay, we'll both tell her [guffaw]." "Hee hee hee, I can't WAIT!" "Ha haaaaaaaah, this is going to be so great!" Oh! That look in Toby's eyes and her clench teeth smile! Malicious! If she and Cameron can't be truly happy, She'll make sure Estelle will taste the same ash in her mouth! Why should Estelle believe either of them? They should tell Libby, who will then tell Estelle. Toby shows off her Meddler-in-Training skills, chiefly that there is nothing greater in life than Being Right about Something...As for AZ, how about "Arnold Ziffel", another character who was able to create a false (and hilarious)reality? His Name and photo may be fake, Mary? 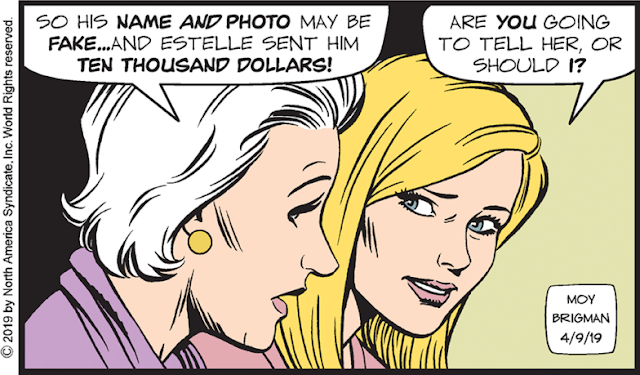 I think you can dispense with giving Estelle's scammer the benefit of the doubt at this point. That combined with the notion that Estelle never tried to look this guy up at all prior to sending him ten large strongly suggests lead in the pipes at Charterstone. There’s nae leid in Ian Cameron’s pipes, I’ll teel ye! Maybe $10K was worth it to Estelle for all the wonderful conversations, flirting, praise, and flattery that she received over the past weeks/months. Scottie McW, your dialogue had me guffawing. Is it too much to hope that when she finds out she's been duped, Estelle will grab Libby and a filleting knife, holding it to the cat's throat and tell Mary "you're gonna get me back my ten g's or it's lights out for this stinking cat!"